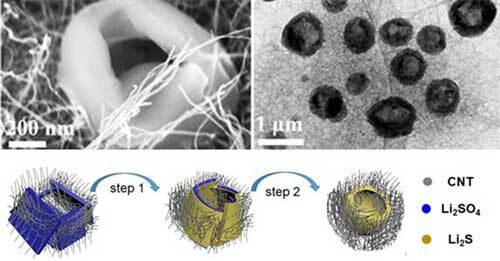 (Nanowerk News) A Korea Advanced Institute of Science and Technology (KAIST) research team developed a lithium-sulfur battery with a doughnut-shaped active material structure showing a record lifecycle of over 600 cycles (Advanced Science, "An Ultrahigh Capacity Graphite/Li2S Battery with Holey-Li2S Nanoarchitectures"). Having higher energy density and lower production cost than a lithium-ion battery (LIB), it can be used in electric vehicles that require a longer battery life. There has been an intense research conducted for developing lithium -sulfur batteries with high energy density because LIBs only allow for a very short travel distance per charge. However, Li-S batteries are still unable to provide a longer lifecycle due to the poor reversibility of the lithium metal cathode. To tackle this issue, Professor Hee-Tak Kim from the Department of Chemical and Biomolecular Engineering and his team used lithium sulfide (Li2S) cathodes and combine them with graphite anodes to enhance energy density and lifecycles for the batteries. Yet, lithium sulfide is costly and, so far, there has not been an electrode architecture and electrolyte design that enables a longer lifecycle between the graphite anodes and lithium sulfide cathodes. Hence, the team produced a doughnut-shaped lithium sulfide cathode active material from low-cost lithium sulfide developed from raw materials. They have also developed a lithium sulfide ion battery with a graphite anode and lithium sulfide cathode using a high concentration salt electrolyte. This doughnut-shaped lithium sulfide showed outstanding charge and discharge reversibility through improving the transfer of lithium ions. Its highly concentrated salt electrolyte formed a stable film on the surface of the graphite electrode, which showed strong durability. Through this technology, the team achieved 30% higher energy density than that of conventional LIBs and secured a lifecycle of more than 600 cycles. This doughnut-shaped lithium sulfide-based electrode can be manufactured using low-cost raw materials and a single heat treatment process. The electrode can also be applied to existing LIBs.